Here are the values of the density function stored as three dimensional, discrete grid, a big array. A possible source is for example the editor Acropora by Voxelogic. It can export it’s data as 3D DDS texture where each pixel can be interpreted as 32 bit float value. Naturally, the volume component supports it’s own optimized saving and loading of discrete grids, a later article covers this. All in all, this article is quite math heavy, but every formula is simple on its own and can be literally translated into code, so don’t be scared. To give some options to the user to decide between loading time and quality, two methods to calculate the density and four for the gradient are given. Calculating the density value can be done by interpolating via a “Nearest Neighbor” interpolation or a trilinear interpolation. is a function to get the value of the 3D grid at the integer coordinate (x, y, z). So the wanted density value is given by . 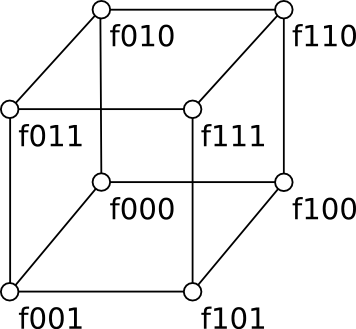 The range of x, y and z is from 0 to 1 with (0, 0, 0) being the vertex and (1, 1, 1) being the vertex in figure 1. So the given coordinate must be normalized into this range and translated into the origin of the grid space. In case of the discrete grid, only the translation is needed because the array values already have a distance of one to each other. is the grid value . Respective is the grid value . The gradient can be calculated either by using the nearest neighbor interpolation by evaluating or by trilinear interpolation. to are in this case the gradients at the cubus vertices instead of the grid values. is the calculation of the gradient at an integer coordinate. It can be calculated either like Lorensen and Cline in the original Marching Cubes paper [LC87, P. 3] or with a Sobel filter. The division by the cube length of the original version is left out here, because its 1 anyway in the grid. A second possibility is the determination with a Sobel filter which adds a low pass filter and so is less prone to noise in the grid [Tö05, P. 176 – 178]. Experience has shown, that the configuration with using trilinear interpolation for the density and nearest neighbor for the gradient without Sobel filter gives good results while keeping the loading time reasonable.